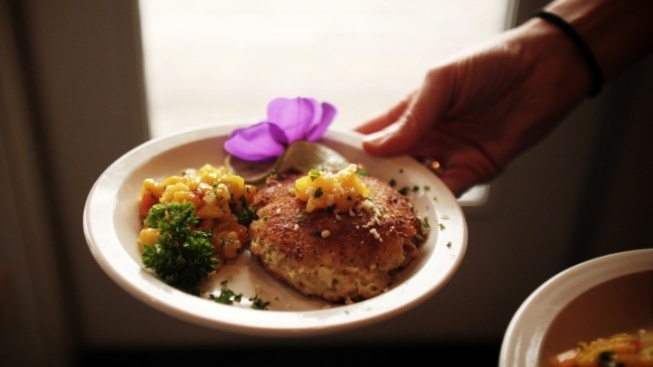 Find tangy, briny, deep-flavored discs at the Crab Cake Cook-off in Fort Bragg. Be in Fort Bragg on the final Saturday of 2019 for all sorts of seafood-major crab cakes created by top-notch chefs. CRAB CAKE COOK-OFF... & Wine Tasting Competition, and it snaps its claws on Saturday, Jan. 26, 2019 in Fort Bragg. The three-hour to-do means lots of tastings for those guests who purchase a $90 ticket, with the vinos hailing from "America's Greenest Wine Region" and the crabby cakery created by area seafood pros of the most chefly assortment. Other happenings, like auctions, will also flower, lest you think the wonderful winter afternoon is solely about the enjoyment of the hearty, spice-laden concoctions. Of course, the cook-off isn't the only thing drawing diners from near and far during that time; Winter Feast Mendocino will be delivering all sorts of dining pleasures, and outdoorsy activities, in multiple spots. FOR MORE... on this bundle-up, take-a-bite bash, which runs from Jan. 18 through 27, scurry, like a crab, in the direction of the mondo foodie-tacular's site now.